Our Funarena! : Indian Politics: More Cartoons Out Of The Cupboard! Article first published as Indian Politics: More Cartoons Out Of The Cupboard! on Technorati. The cartoon was first published in 1949. It was esthetically done and genuinely humorous. Therefore, it was included in Indian textbooks meant for eleventh standard school students in 2006 to make education informative as well as enjoyable. After 63 years from first publication and 6 years from inclusion in textbooks the ‘issue’ of the cartoon rocked and disrupted the Indian Parliament on May 11, 2012. The reason or motivation seemed to be obvious—to embarrass the tottering ruling coalition further in light of impending General Elections of 2014. The cartoon involved two all-time greats in Indian history. Dr. Bhimrao Ramji Ambedkar, popularly known as Babasaheb, donned the role of a real father of the Indian Constitution and fought tirelessly for the Dalits or the Untouchables or the oppressed all his life. Belonging to a backward caste of Maharashtra he struggled at every stage of his life to rise to eminence as a sociopolitical reformer, scholar-philosopher, writer-editor and a leader-politician. His immense contribution to the liberation of the Dalit communities from social discrimination made him almost a God or an Avatar (incarnation of God) for them particularly after his demise. His birth anniversary on April 14 and death anniversary on December 6 are huge events in Mumbai and other places of Maharashtra with millions offering prayers and respects. 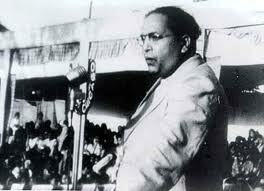 Dr. Ambedkar has also been posthumously awarded the Bharat Ratna in 1990—the highest civilian honor in India. The second personality involved in the cartoon was Pundit Jawaharlal Nehru—the first Prime Minister of India and one of the path-breakers for the emergence of India as a modern developing nation. 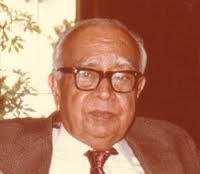 And not the least, the cartoonist Shankar Pillai has also been recognized as the father of political cartooning in India and he was the recipient of the second highest civilian honor of India. 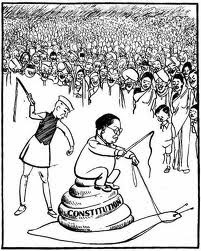 Now, the said cartoon draws a picture of Dr. Ambedkar—the Chairman of the Drafting Committee of the Indian Constitution-- sitting on a lump named ‘Constitution’ kept on the back of a snail brandishing a whip. Behind him stands Jawaharlal Nehru—the then Prime Minister—in action with a whip too. Apparently, both are trying to speed up the process of drafting that for a country like India was the most challenging job, because it had to satisfy all ethnically, culturally and linguistically diverse states and people of independent India. The humor was pulsating as the helplessness was vivid. Both Ambedkar and Nehru must have enjoyed it a lot at that time. But at the present time all interpretations had to go political. 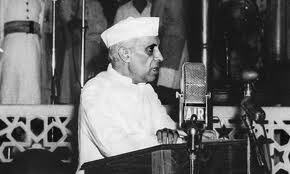 ‘Nehru whipping Ambedkar!’, ‘Insult to Babasaheb!’, ‘Babasaheb cannot sit in front of a whipping Nehru!’, ‘Insult to all Dalits of India!’ and so on cutting across all opposition political parties of India. The panicky government had to announce the immediate withdrawal of the concerned textbooks from markets and removal of the cartoon next. Basic questions never got answered. Why opposition now and not in 1949 or after 2006? What were the ‘affected’ or ‘insulted’ parties doing all the while? Was it a reaction to the ouster of Mayawati in Uttar Pradesh? A dress rehearsal for General Elections 2014? Or taking on a cue from the merciless Mamata’s tirade against creative intellectuals and cartoonists? As for the larger Dalit masses political leadership and influence had been the mainstay of their existence in recent years and basically, maybe, they could never accept the spectacle of their God sitting in front of a whipping ‘master’. The oft repeated zero tolerance for terror or corruption has been increasingly infiltrating creative fields in India which is ominous! Taking intolerance to a shocking level one breakaway group of the Republican Party of India today attacked and vandalized the office of Suhas Palshikar in Pune, Maharashtra. Palshikar was one of the two advisers to the National Council of Educational Research and Training (NCERT) who resigned yesterday over the controversy. NCERT is the apex body of school education in India and these two advisers were in the Textbook Developing Committee. Palshikar and his colleague maintained that the controversy was totally unnecessary and that there was no insult to Babasaheb Ambedkar. There should have been a nationwide debate on this issue concerning a legendary personality for whom they themselves had the highest respect, they added.